This is a rare Batmobile model kit from 2003. There were only about 15 ever made. It is a highly accurate custom model of the TV Batmobile in the large 1:16 scale. 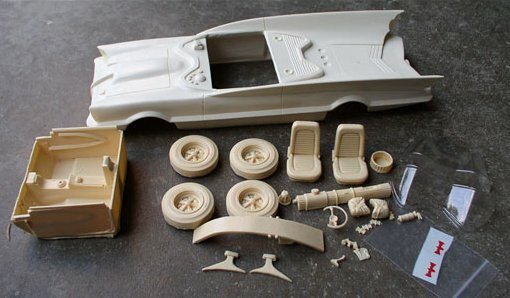 It comes with everything seen in the kit picture to build up a beautiful Batmobile. Wheels, Canopies, Body, Decals and all other parts shown. (sorry no figures) Note that this is not the smaller 1:25 scale size made by dozens of people in the world, but the larger 1:16 size (13" long) that fits in with many diecast collections.